Perry, the man behind New York Street Food, is one of the city’s leading authorities on food trucks and food carts. Along with bringing our readers the latest news from the street food scene, he’ll be providing reviews and some of his favorite truck items. First up is a brand new truck that’s been on the street less than a week: Phil’s Steaks. When I spoke with the guys from Phil’s a while back, they were amazed there was not already a Philly cheesesteak truck in New York. There are plenty of places in New York that serve cheesesteak, but most are lacking. These guys are the real deal. Last Saturday, I went up to 23rd St & 5th Ave for the truck’s first day out. I got the lowdown from the guys (and gal) in the truck and in addition to having a cheesesteak hot off the grill, I brought one home for my family to try. Working at Phil’s are a mix of people from Philly, New York and some other places. They told me they spent a lot of time testing out meat and cheese from numerous vendors before making their final choices. The options are many. You can get beef or chicken, wit’ or wit’out grilled onions, add peppers, mushrooms, tomato, lettuce and extra cheese, of which they have white American, provolone and whiz. 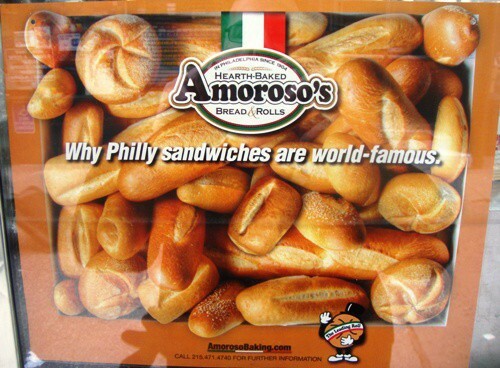 As for the bread, they use Amoroso’s, which is as authentic as you can get for a Philly cheesesteak. 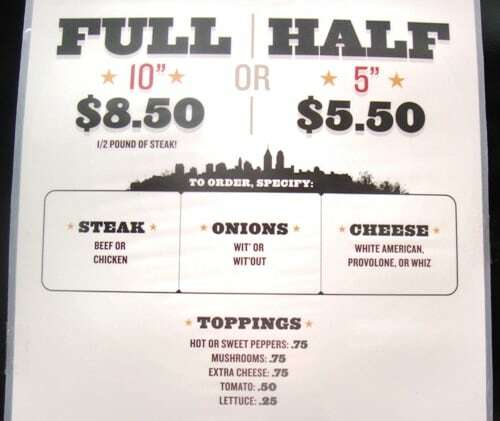 A full-sized 10″ hero is $8.50, and it comes with 1/2 pound of meat(!) You can also get a half for $5.50. You can see the full sandwich menu here and the combo menu here. As you can see from the combo menu (and the small logo on the truck’s door), Phil’s is working with Cupcake Stop to offer several different cupcake flavors daily for dessert. For our first cheesesteak, we asked J.J. on the truck what he recommended, and he said his favorite was beef wit’ onions, white American and whiz. Sold! You have to be a little careful eating the sandwich right away because it’s full of heat and steam, and I almost burned my mouth. (The risks I take are unbelievable). The beef was shaved thin, but you could tell it was decent quality meat. It wasn’t fatty at all, and every bite was delicious. Every bite was also filled with the taste of cheese, making it a true cheesesteak. I’m not a big fan of cheez whiz, although mixed with white American, it added some edge to the sandwich. I also put some hot sauce on the 2nd half of my sandwich, which was a real nice addition. The bread was nice and soft and held everything together well, but these sandwiches are made for eating right away. 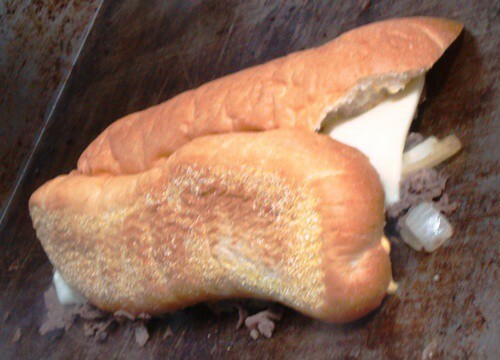 The cheesesteak I ate at the truck was hotter and the bread firmer than the one I brought home for my family to try (photo below) – although they seemed to enjoy it just fine. I definitely want to try the chicken cheesesteak next time, and will probably get mushrooms and provolone for some variety. You can make your own decision on what to get at Phil’s, but let us know your thoughts after trying them out. You can find Phil’s Steaks on twitter here or on the New York Street Food Mobile Munchies twitter feed.